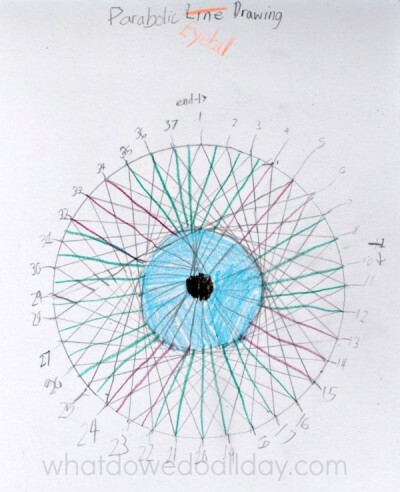 That’s when I knew I had a great math art activity for us to do together. Since my sons are naturally drawn to S.T.E.M. – themed activities, I do try and find ways to sneak in the “A” to make it S.T.E.A.M., in which the “A” stands for Art and Design. 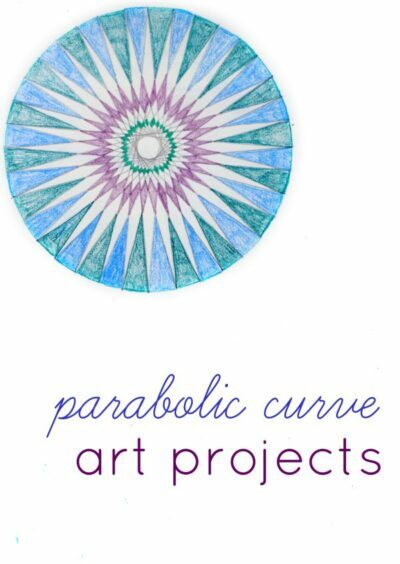 Last week I shared our Fibonacci Art Project, and like that lesson, our exploration of parabolic curves is just that: a process-based exploration. Pens. We’ve switched from Sharpies to Flair pens. You only have to smell them to find out why. 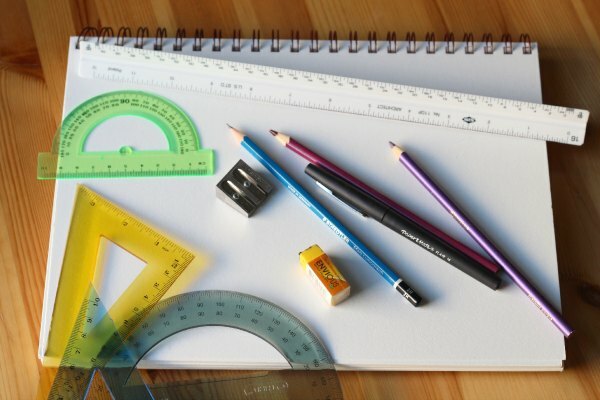 Rulers or straight edges. 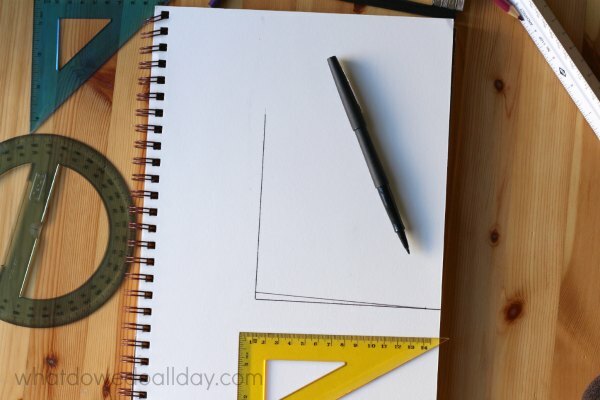 It’s easier to create squares if you have a triangle or t-square. I think it’s well worth having a math set. They aren’t very expensive and they are loads of fun, not to mention being handy for school projects. Paper. We made ours in our art journal. The mixed media visual art journal is our absolute favorite, which regular readers (waving hello!) know that I frequently sing the praises of. Alternatively, you can use graph paper. Sharpener. You want sharp, sharp pencils for this project! Colored pencils. Optional, but fun. 2. Divide the lines into equal divisions. In my example I’ve uses 5 millimeter increments. 4. Continue until all the lines have been drawn. Voila! A “curved” line appears. 5. Optional: go over pencil lines with marker and/or use colored pencils to create colorful designs. 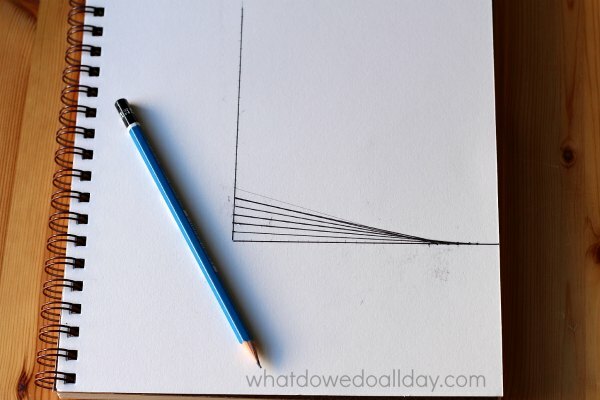 TIP: For kids just starting out, divide the lines with wider marks. My example above is 5 mm, but Kiddo preferred to work with 1 cm sections. 1. A single parabolic curve, while cool, is just the beginning. 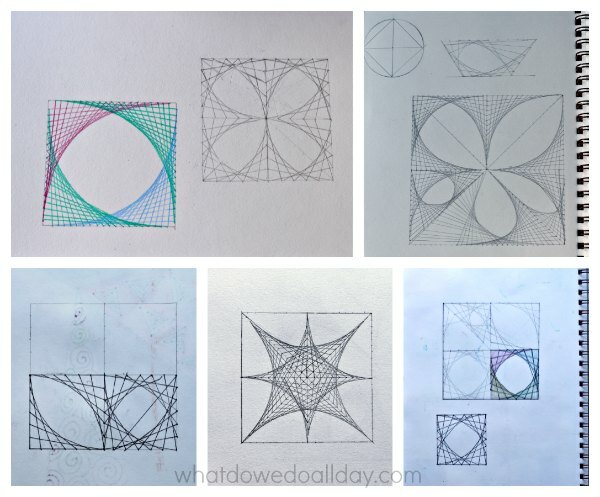 Encourage your kids to create boxes, triangles, and interlocking shapes as a basis to create elaborate math art designs! 2. Connect the dots in a circle! My son created a “parabolic eyeball”. MORE: Tessellations and the Pi Skyline are two of our favorite math drawing projects. 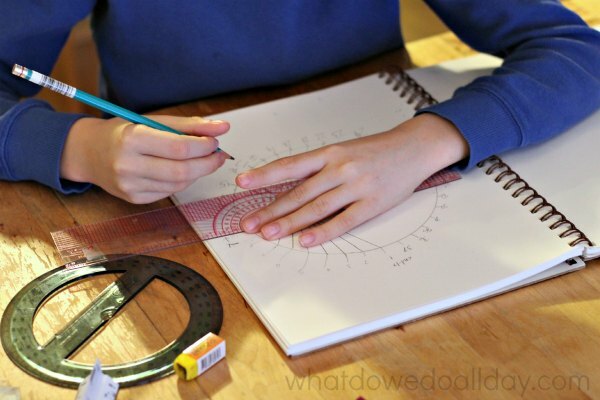 Little kids can practice connecting the dots, too, with a giant dot to dot. Or check out more fantastic patterns in these math art books. 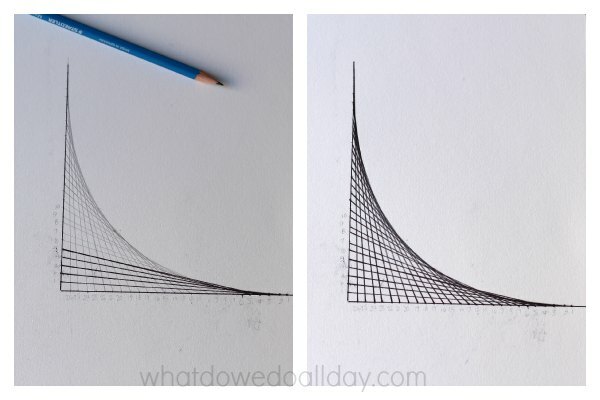 I love this math art! I used to make these kinds of pictures when I was a kid, just for fun. Thanks for linking up at STEM Saturday! I remember making patterns like this when I was in elementary school. Drawing the lines was only one way to do it – we also used thin card or counted cross-stitch fabric and a needle and embroidery thread, or we used pieces of wood with nails banged in to them. I remember visiting a classmate’s home and her mother had one that she’d made hanging on the wall as artwork – painted black wood, black nails, and white threads. Precision placing of the holes or nails was key to a good design! String art is very cool. This looks very effective, thanks for sharing. I’m wondering what ‘math’ you taught alongside this. what about parabolas did you discuss? This is pushing my own knowledge so I’d love to make some stronger math links as well as making a nice design. I don’t homeschool so this was primarily for fun. I like to show my son how math can produce wonderful art. But of course you can certainly discuss the characteristics of parabola, their relationship to conical structures, and also symmetry.